One of the popular summer entertainment is the river cruise on any ship. From year to year, vessels ply the water spaces. Visitors will learn something new about the local nature. But if you don't have enough money for this kind of entertainment, do not despair. 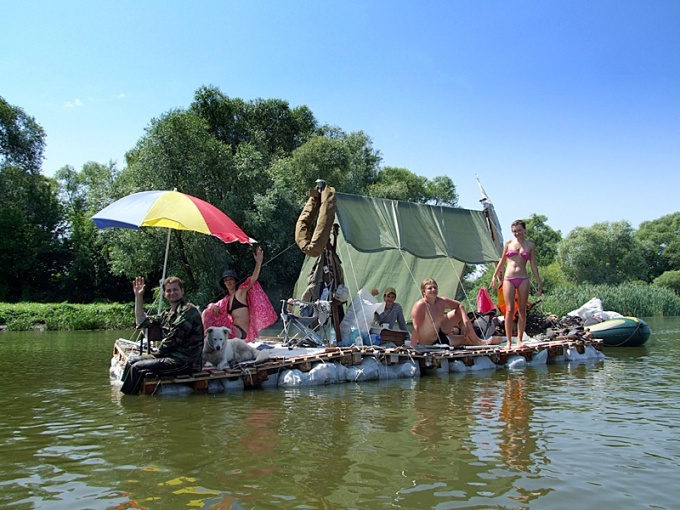 A great alternative to the river cruise is boating and Canoeing on the river on a makeshift raft. This is more romance than in Catania on the boat. However, the raft should not be too bulky and heavy to be able to convey to the river and release the water. The ideal option would be a raft of plastic bottles. Take ten five-liter bottles and glue them in a number of water-resistant tape. Gluing necessary, carefully winding each bottle. This will give proper strength of your design. The tape should be waterproof. Otherwise, the raft will fall apart very quickly. Repeat this procedure again. In the result you should have two rows of tightly sealed bottles. Then you should be good to merge those two rows. Do not spare the tape, the stronger the design, the safer. Then you will need bottles of two-liter volume. Take ten bottles and glue them in a row, as well as five-liter bottles. We need to make sixteen of these series. You need to take crisp bag (ideal option would be a plastic bag) and place four rows glued up two-liter bottles. You need to procure four of these bags. Each must tightly wrap the tape. It's undesirable to use cloth bags. They quickly become wet and heavy, which adversely affects the stability of the raft. Next, you will need to take four boards. To put together them with each other to form a square. This design will frame the future of the raft. On each side you should attach the bag with the bottles that were prepared previously. For attaching bags to a wooden skeleton you need to use ropes and duct tape. Bag it is best to tie a rope cross, and then glue tape for maximum strength. In the middle of the wooden frame you have to place harvested earlier rows of five-liter bottles. They also must be well attached with tape to boards.Your raft is ready. You only have to put in the water.